Selective-fire assault rifle fed from a detachable magazine. Modernized variant with a lot of attachments available. 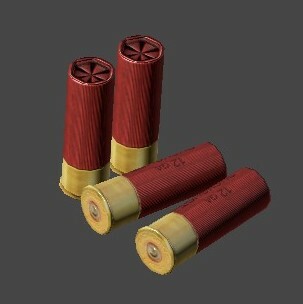 Uses 7.62x39mm rounds. 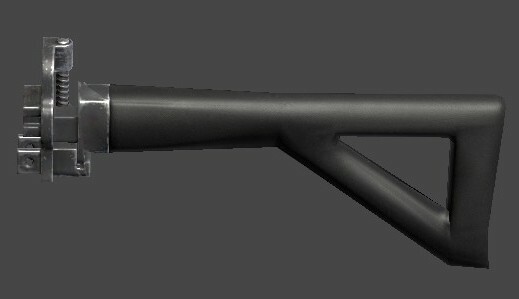 A bolt-action hunting rifle, fed from a detachable magazine. It is light and accurate at intermediate ranges. 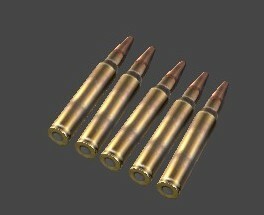 Uses 7.62x39mm rounds. Compact selective-fire submachine gun, fed from a detachable magazine. Often used as a sidearm. 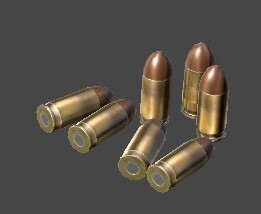 Uses .380 ACP rounds. 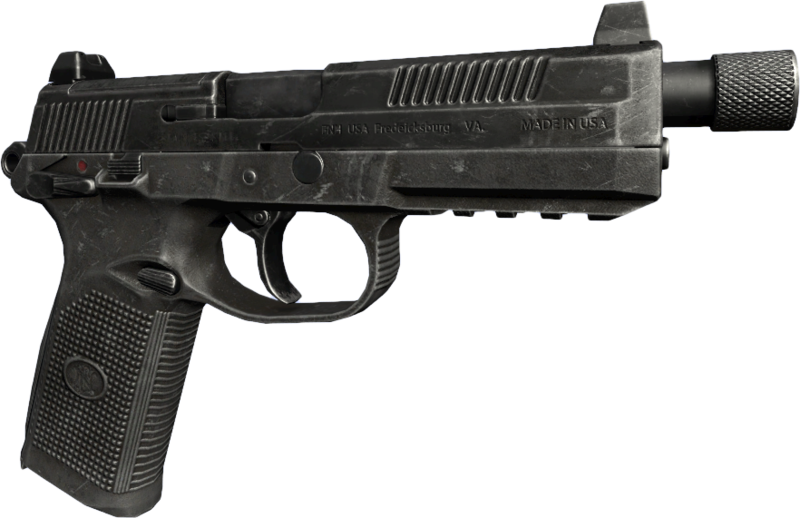 Semi-automatic pistol, fed from a detachable magazine. Popular due to good quality and affordable price. Uses 9x19mm rounds. Selective-fire battle rifle, fed from a detachable magazine. Open for customization with attachments. 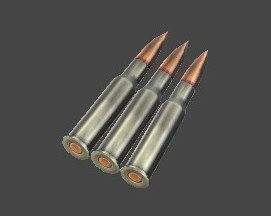 Uses .308 WIN rounds. 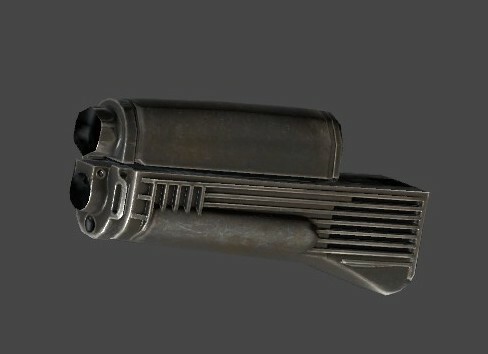 Semi-automatic pistol, fed from a detachable magazine. Made in tactical variant. Uses .45 ACP rounds. Sawed-off single shot break action hunting rifle, designed with simplicity, built to last. 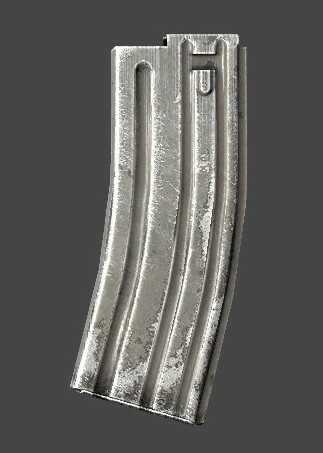 Uses 7.62x39mm rounds. Selective-fire assault rifle, fed from a standardized detachable magazine. Offers a lot of customization with attachments. Uses 5.56x45mm rounds. Selective-fire submachine gun, fed from a detachable magazine. Very high rate of fire. Uses 9x19mm rounds. 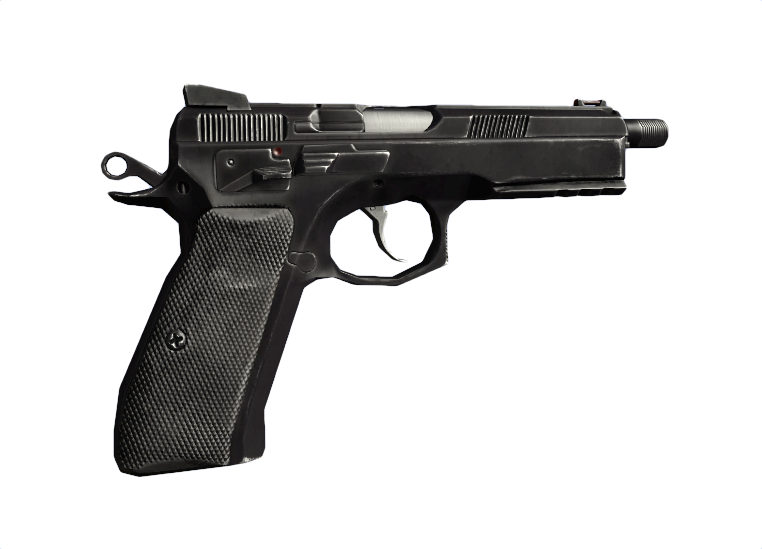 Semi-automatic pistol, fed from a detachable magazine. Produced in large quantities. 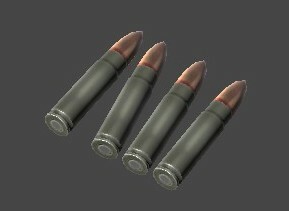 Uses standard .380 Auto rounds. Sawed-off five shot bolt-action rifle, fed from internal magazine. Still usable today due to its sturdiness. Uses 7.62x54mmR rounds. Six shot pump action shotgun fed from internal magazine. Good for hunting dangerous game. Uses both 12ga bucks and slugs. A ten-shot semi-automatic rifle, fed from an internal magazine. Older model, but still reliable. 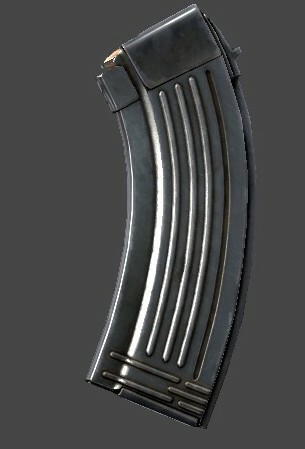 Uses 7.62x39mm rounds. Semi-automatic marksmen rifle fed from a detachable magazine. 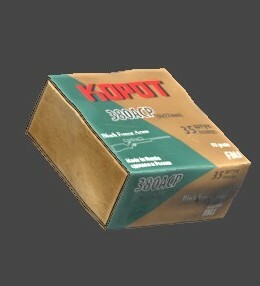 Compatible with KA scopes. Uses 7.62x54mmR rounds. 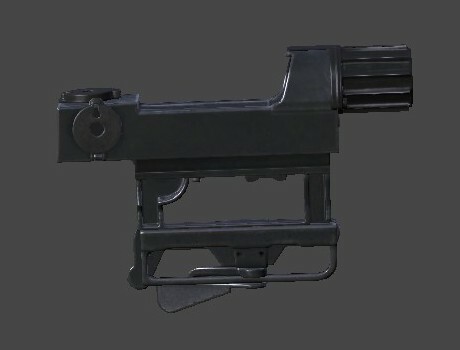 Selective-fire submachine gun fed from a detachable magazine. High caliber makes up for slower fire rate. Uses .45 ACP rounds. 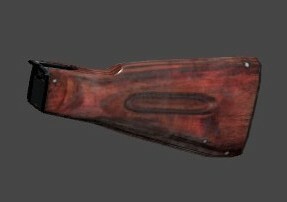 Five shot bolt-action hunting rifle, fed from an internal magazine. Reliability and high performance of a proven design. 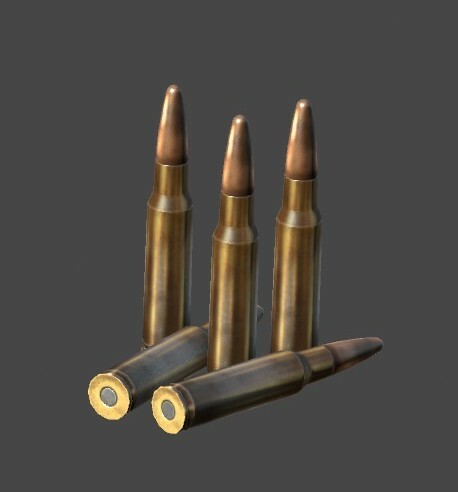 Uses .308 WIN rounds. 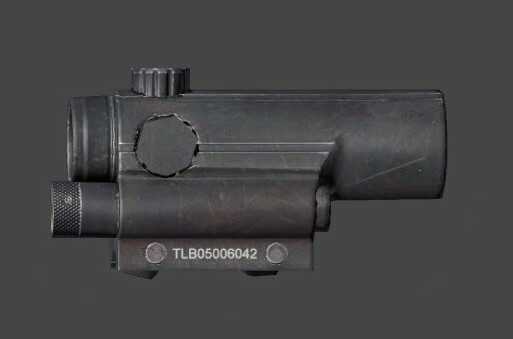 A standardized rail-mounted, 4x magnifying scope with tritium-illuminated reticle designed for M4-A1 assault rifle. 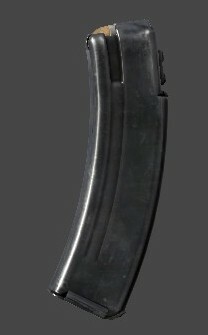 A folding buttstock for KA based assault rifle. A polymer buttstock for KA based assault rifles. A polymer handguard for KA based assault rifles. 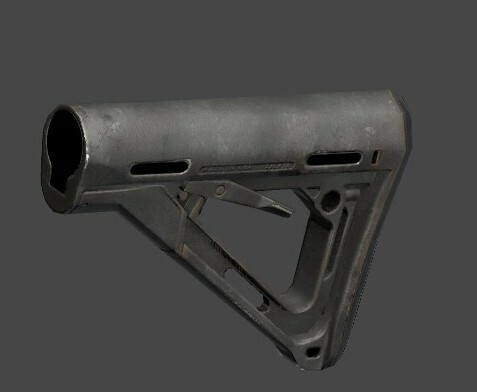 A rail handguard for KA based assault rifle. Allows mounting of additional accessories. A muzzle device for select rifles used by Eastern forces. Reduces sound intensity and muzzle flash generated by firing. 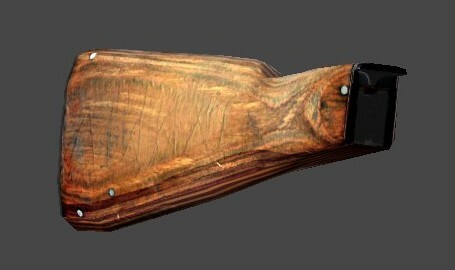 A wooden buttstock for KA based assault rifle. 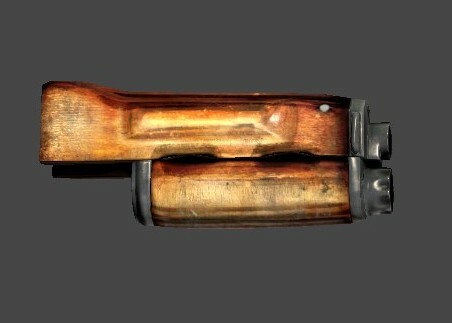 A wooden handguard for KA based assault rifle. A mounted non-magnifying optics with a battery-powered illuminated reticle. Intended for use with compatible pistols. A folding buttstock for the LAR battle rifle. 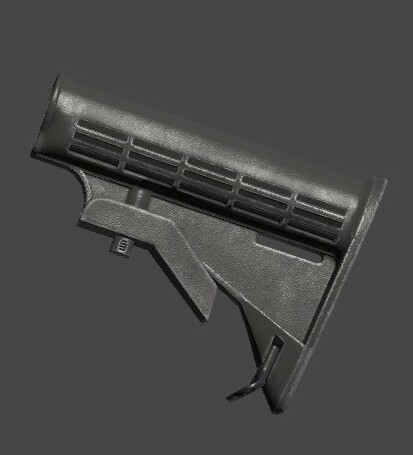 A polymer buttstock for the LAR battle rifle. A mounted 4x-8x-12x variable magnification hunting scope. Simple, robust and precise, compatible with most hunting rifles. Side-mounted, non-magnifying optics with battery-powered illuminated reticle for KA based rifles. 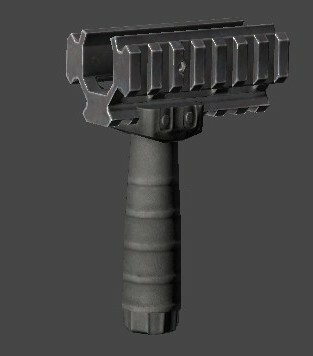 A CQB buttstock for M4-A1 assault rifles. A standardized rail-mounted carry handle with iron sights designed for M4-A1 assault rifle. 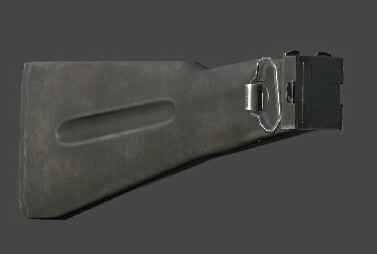 A MP series buttstock for M4-A1 assault rifles. 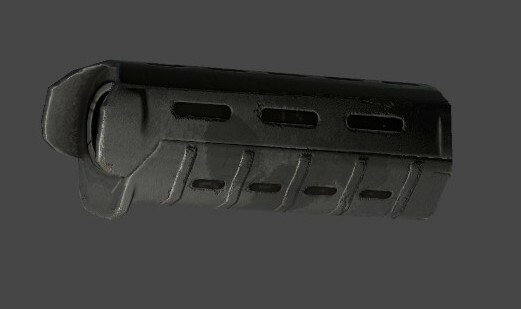 A MP series handguard for M4-A1 assault rifle. 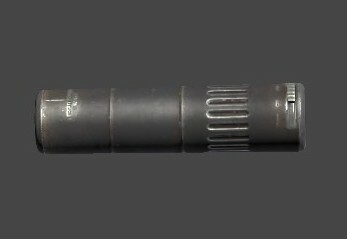 A telescopic buttstock for M4-A1 assault rifle. 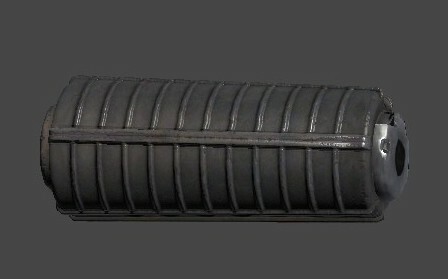 A polymer handguard for M4-A1 assault rifle. 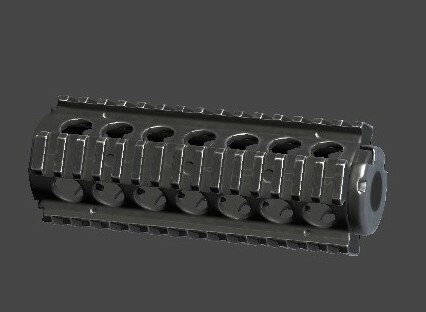 A rail handguard for M4-A1 assault rifle. Allows mounting of additional accessories. A muzzle device for select rifles used by alliance forces. Reduces sound intensity and muzzle flash generated by firing. A standardized rail-mounted, non-magnifying optics with a battery-powered illuminated reticle. Standardized rail-mounted, non-magnifying optics with battery-powered illuminated reticle designed for M4-A1 assault rifle. 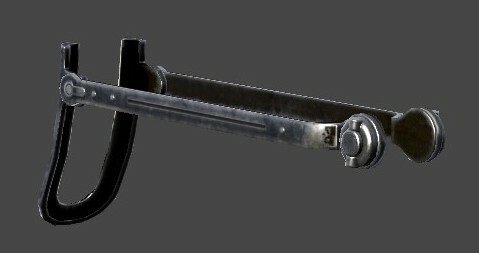 A muzzle device for SG5-K submachine gun. 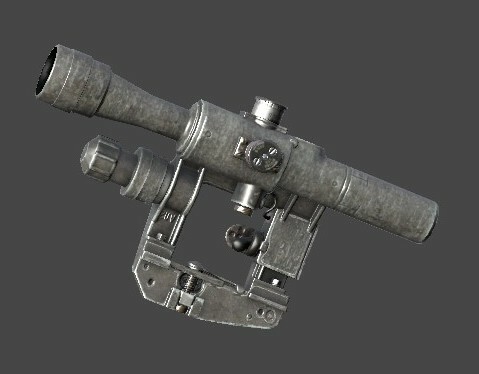 Used to counter recoil during firing. 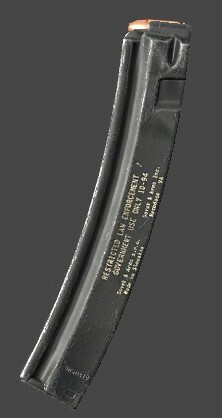 A polymer handguard with vertical grip for SG5-K submachine gun. 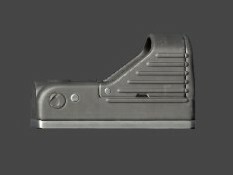 A rail handguard with vertical grip for SG5-K submachine gun. Allows mounting of additional accessories. 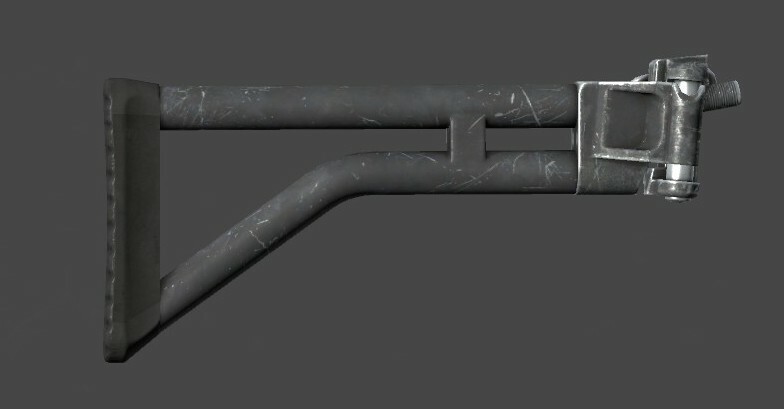 A folding buttstock for SG5-K submachine gun. Detachable box magazine for KA-M assault rifle. Holds up to 30 rounds of 7.62x39mm. Detachable box magazine for the CR-527 rifle. 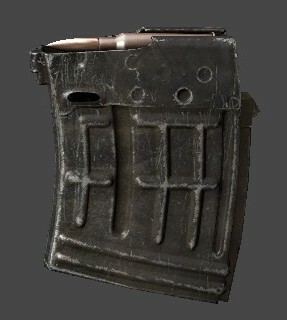 Holds up to 5 rounds of 7.62x39mm. Detachable box magazine for Skorpion submachine gun. Holds up to 20 rounds of .380 ACP. Detachable box magazine for CR-75 pistol. Holds up to 15 rounds of 9x19mm. Detachable box magazine for the LAR battle rifle. Holds up to 20 rounds of .308 WIN. 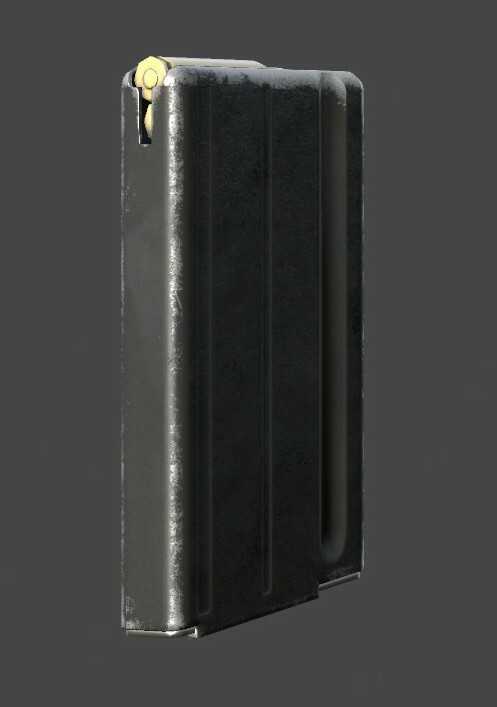 Detachable box magazine for FX-45 pistol. Holds up to 15 rounds of .45 ACP. 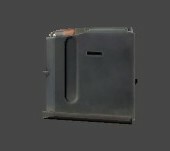 Detachable box magazine for SG5-K submachine gun. Holds up to 30 rounds of 9x19mm. 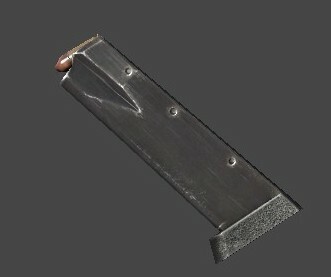 Standardized magazine for compliant assault rifles used by alliance forces. Holds up to 30 rounds of 5.56x45mm. Detachable box magazine for VSD marksmen rifle. 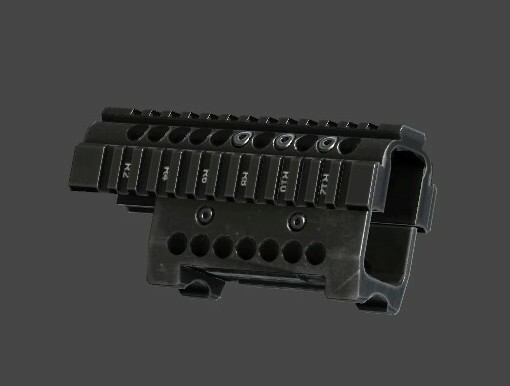 Holds up to 10 rounds of 7.62x54mmR. Detachable box magazine for USG-45 submachine gun. Holds up to 25 rounds of .45 ACP. 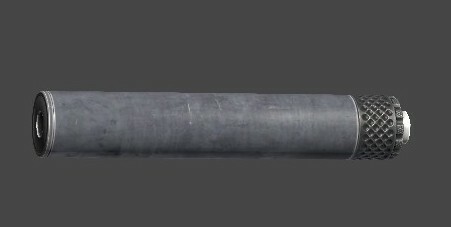 A muzzle device for Mosin 91/30 rifle. 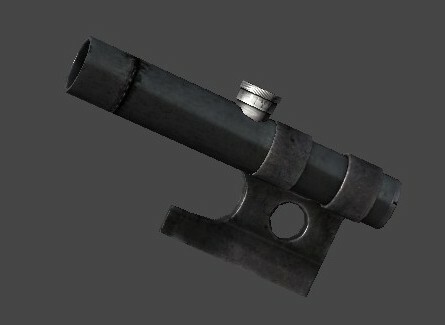 Used to counter recoil during firing. A side-mounted, 4x magnifying scope with battery-powered illuminated reticle for KA based rifles. 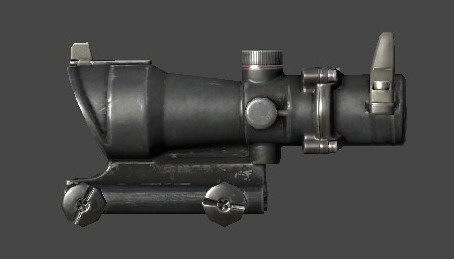 A side-mounted, 3.5x magnifying scope with a non-illuminated reticle for Mosin 91/30 and SK 59/66. 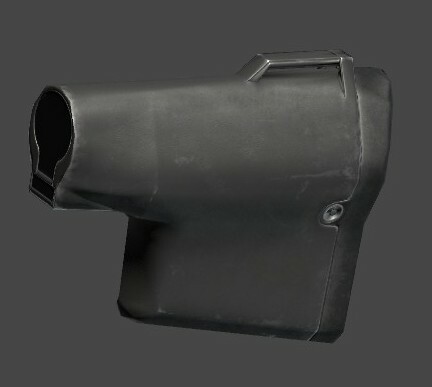 A muzzle device for select pistols and submachine guns. Reduces sound intensity and muzzle flash generated by firing. A flashlight attachable to any pistol with an available rail mount. Provides tactical advantage. 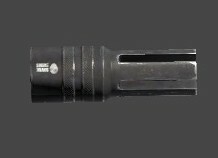 A flashlight attachable to rilfes with an available rail mount. Provides tactical advantage. 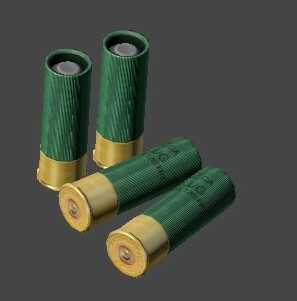 12ga 00 buck shell with 8 pellets. 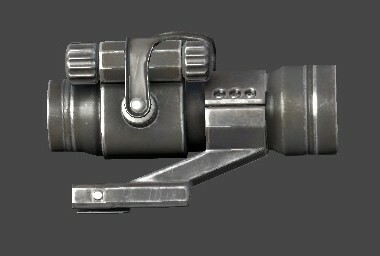 Used in shotguns. 12ga shell with one rifled slug. 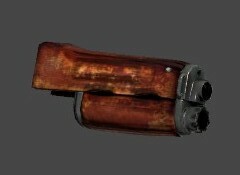 Used in shotguns. .308 WIN full power cartridge. Used in select rifles. 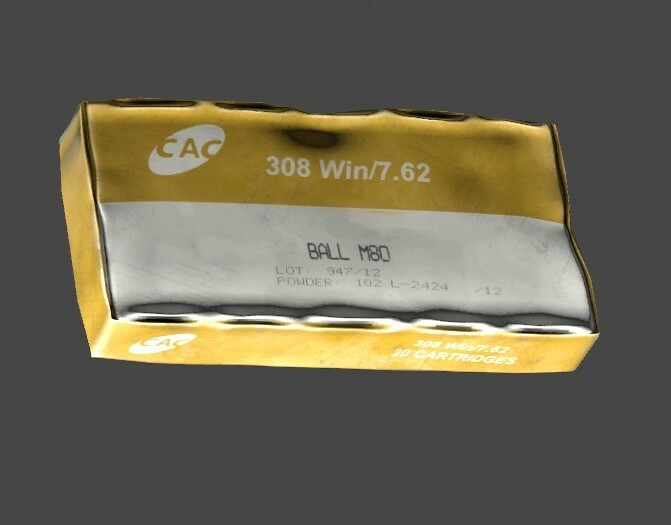 .380 ACP pistol cartridge. 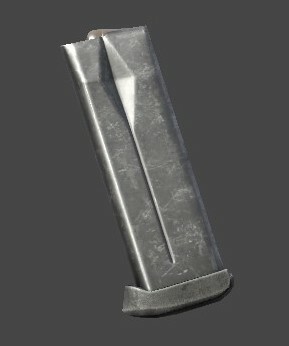 Used in select pistols and SMGs. .45 ACP pistol cartridge. 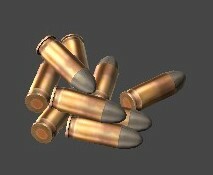 Used in select pistols and SMGs. 5.56x45mm intermediate cartridge. Used in select rifles. 7.62x39mm intermediate cartridge. Used in select rifles. 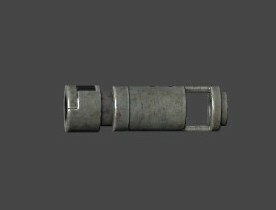 7.62x54mmR full power cartridge. Used in select rifles. 9x19mm pistol cartridge. 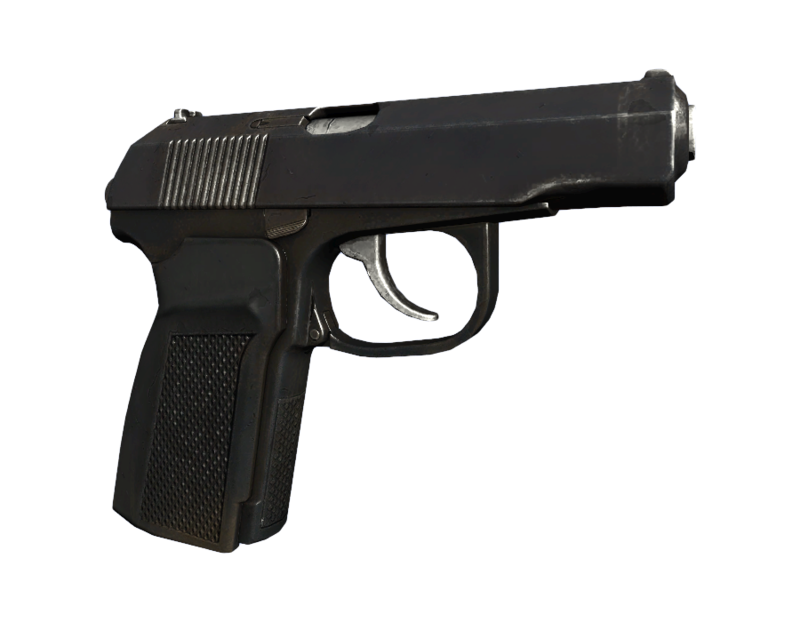 Used in select pistols and SMGs. A metal storage box. Originally designed for holding ammunition, but can store other things too. 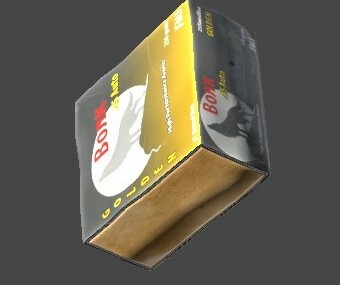 A box of 12ga 00 buckshots. A box of 12ga rifled slugs. A box of .308 WIN rounds. A box of .380 ACP rounds. A box of .45 ACP rounds. A box of 5.56x45mm rounds. 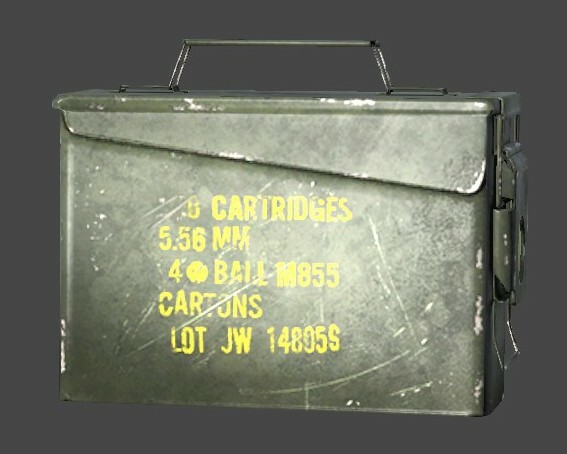 A box of 7.62x39mm rounds. 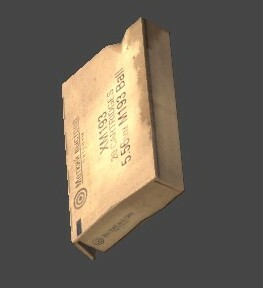 A box of 7.62x54mmR rounds. A box of 9x19mm rounds. 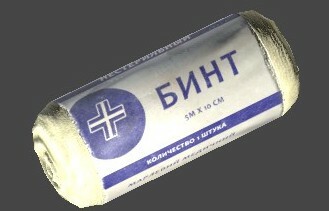 A roll of non-sterile gauze bandage. 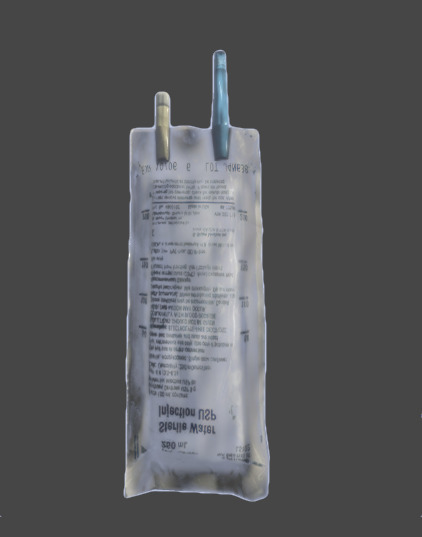 Can be used to directly stop the bleeding, but can also be used other ways. 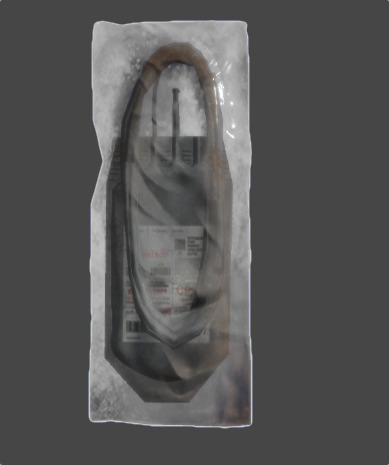 An empty bag for collecting blood directly. Contains anticoagulations to extend usefulness of the collected blood. Single-use blood type test kit contains everything needed to perform a complete blood test for ABO and Rh. Made of activated charcoal. 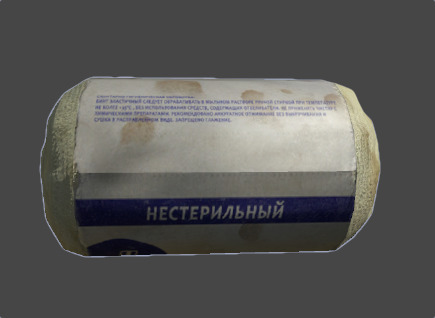 Used as absorbent to treat poisoning and overdose or as filling for gas mask filters. Home proven alcohol-based tincture with herbal extracts. Used to disinfect scratches, wounds, and other things. 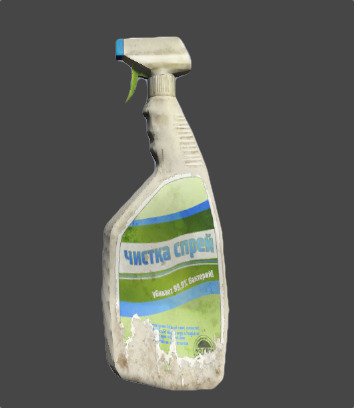 A spray bottle of disinfectant. Is supposed to kill viruses and bacteria, eliminate germs and undesirable odors. 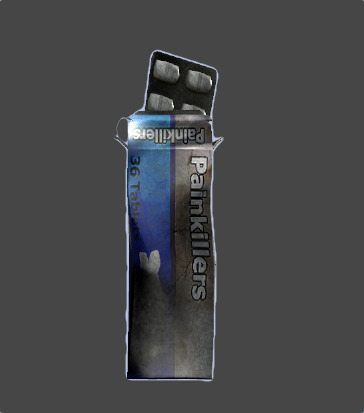 A painkiller pill, suitable for treating weak or moderate pains. Also used as cough medicine. 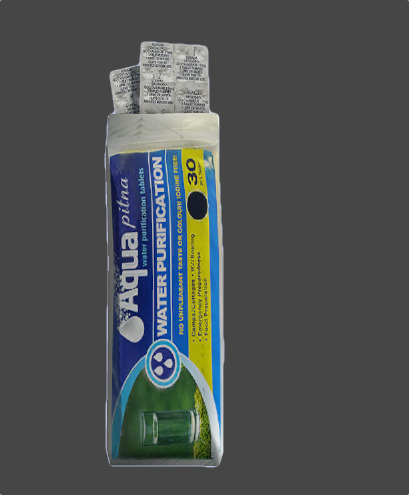 Water purification tablets are used to chemically disinfect water from untreated sources for drinking purposes. 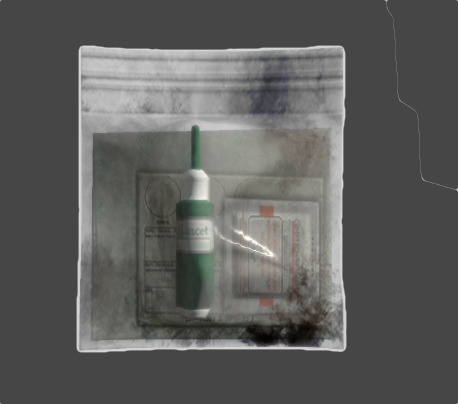 A bag of saline solution. Used to treat dehydration and accelerate blood regeneration. Lacks any means of delivery into the bloodstream. Broad spectrum antibiotics. Used to treat bacterial infectious diseases. Not effective against viruses. Glass thermometer filled with mercury. Can be used to help with diagnosis if feeling under the weather. 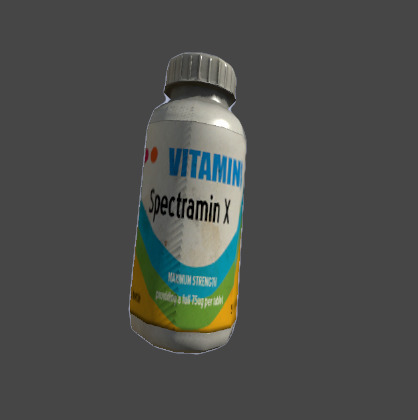 A small bottle with pills that covers a wide spectrum of vitamins, that strengthen your immune system. 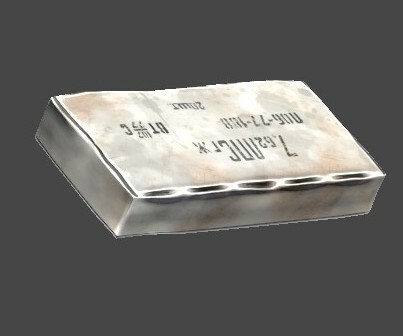 A metal canister, useful for storing large volumes of gasoline or other liquids. 12V rechargeable car battery, usable in cars. It can be used to power other appliances, if connected properly. Radiator that connects to the engine block. Used for cooling a car engine with a coolant, typically water based. A large tent, spacious enough to shelter a parked vehicle or a pile of equipment. Rear left door of the Olga 24 sedan. Keeps the passenger in the backseat safe inside the vehicle. Rear right door of the Olga 24 sedan. Keeps the passenger in the backseat safe inside the vehicle. Hood of the Olga 24 sedan. Helps protect the engine and other sensitive car parts. Trunk lid of the Olga 24 sedan. Used for keeping trunk contents closed. A wheel of the Olga 24 sedan. Tire pattern is designed for high performance on common road surfaces. Engine oil derived from crude oil. Used to reduce friction and wear on moving parts of the engine. Hood of the Ada 4x4 off-road. Helps protect the engine and other sensitive car parts. Trunk door of the Ada 4x4 off-road. Used for keeping trunk contents closed. A wheel of the Ada 4x4 off-road. Deep-treaded tire is used to improve vehicle driving capabilities in terrain. A box containing H7 Headlight Bulb. Locally produced spark plug. Used to deliver electric current to chambers of combustion engine. A plastic case, containing all the tools needed for fixing a car tire. Tire iron not included. 12V rechargable truck battery has higher capacity then regular car battery. It can be used to power other appliances, if connected properly. Hood of the M3S off-road truck. Helps protect the engine against forces of nature or unexpected impacts. A wheel of the M3S off-road truck. Deep tread and specific profile provide grip in difficult terrains. Dual wheel of the M3S off-road truck. Used to keep heavy loaded truck steady while providing needed grip. A roll of barbed wire. Can be used for various trap crafting, you can even use it to tie somebody down. Not that you'd want to! Oil barrel for storing stuff and various liquids in large volumes. Used to catch water or craft things over time. A R-105 portable base radio station operating on wide set of frequencies on long ranges. Can also be hooked to a vehicle battery. Used to charge truck or car batteries when plugged into running electric grid. An alkaline 9V battery. Used for powering various small appliances like flashlights and radio transceivers. Old-fashioned but functional, this marvel of mechanical engineering can almost snap your leg in half. Handheld binoculars. Although not as stable or powerful as tripod-mounted telescope, it can still serve as a powerful surveillance tool. Effective hand-to-hand weapon, easily concealed from unattentive enemies. Makes for a nasty surprise afterwards. A rough sack made from burlap. Can be used as a makeshift blindfold, or cut into strips to create other things. A spool of electrical wire with sockets and plugs, used to connect various electrical components. Camo net, standard military issue. 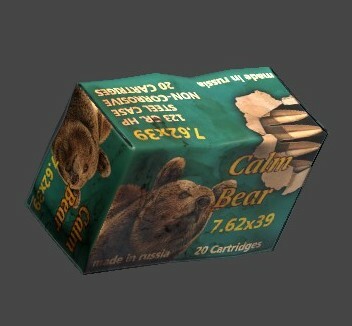 Can be used to mask your base structures, or even to craft a shelter to serve as a temporary hideout. This common household instrument is used to smoothly open metal/tin cans, with no content spilling. Battery-powered tool designed for driving the cattle. Not that it couldn't be used in self-defense, mind you. A self-contained, disposable light-source. Once activated, it cannot be turned off. Useful for location marking in the dark. Folded tourist map of South Zagoria, Chernarus. Displays topography, marked tourist trails, useful points of interest and significant landmarks. Sharp combat knife with a sturdy blade and a handle. Great for self-defense, but it has other, more mundane uses as well. A multi-dial combination lock with a chain long enough for wooden logs of constructed gates. Used for hiking, its needle points to the north, helping with orientation. It is very difficult to get lost with one of these. Standard curved crowbar. Read instructions before use. May cause injuries if handled improperly. A versatile, strong and flexible wide adhesive tape. If it moves and shouldn't, use duct tape. This soft case contains an array of tools for electronics repair and maintenance. Also has several attached diagrams. 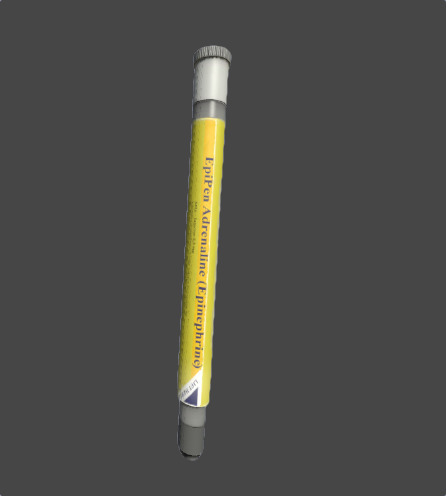 A stick of hand-mixable reinforced epoxy putty. Allows for quick and easy repairing of hard surfaces. Firefighter axe is used primarily for breaking down doors and windows. Can be also used for wood cutting or other mundane activities. A bag of garden lime. Useful fertilizer to speed up growth and to boost crops or leather tanning agent. Invaluable crafting tool, intended to saw off metal pipes. It has other uses as well. Flat metal head can apply more force than other hammers, due to its large size. Certainly useful for various demolition purposes. Small metal keys for opening handcuffs. Losing them makes opening handcuffs a hassle. Steel handcuffs, useful for handcuffing your friends and foes. As they can be locked easily, having keys to unlock them is recommended. Single-handed bladed tool with a hammer head on one side. Except for chopping wood, it has a wide array of uses. A convenient battery-powered LED lamp with a headstrap. Useful in the dark to keep hands free. Small disposable heat source, keeps you warm for a limited time when it's near. Portable barrier that can be relatively easily deployed and filled with soil or gravel, creating durable fortification. This hunting knife is used during hunting to skin animals and cut up the meat. A sharp kitchen knife with broad blade and a sturdy handle. Can handle vegetable as well as meat. A large military tent. It can house a small unit, along with its equipment. An universal leather sewing kit used for stitching leather together, or patching various items made from it. Heavy blunt implement. Also an useful tool for getting wheels off the car for maintenance. Surprisingly sharp large machete. It is basically a big knife. Very useful for self-defense. 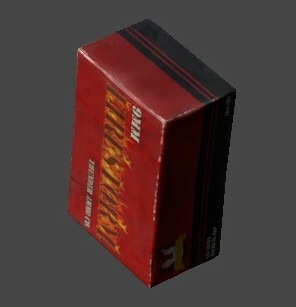 A box of long kitchen safety matches. Store in dry place and keep away from children. A camping tent. Offers a comfortable and dry space, with additional storage space. A megaphone used to make announcements or indiscreetly communicate over large distances. Requires a battery to operate. Metal sheets, great if you need to do some serious building, otherwise not that useful. 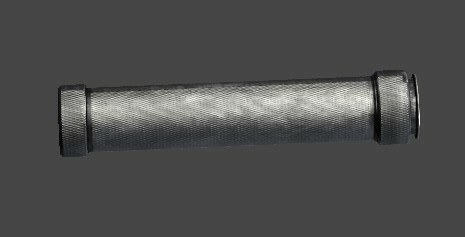 A roll of strong metal wire. Has many uses, from conductors, to trap crafting, to makeshift handcuffs, a metal wire can do it all, and more. A NVG headset. It's quite comfortable to wear. Goggles require a battery to function. A box of 16d-sized nails. Netting with small spaces between yarn. Used to make fishnet or make a base for camouflage. Regular colored pen. Unsurprisingly, can be used for writing and marking things down. Medium range, two-way personal radio with a frequency switch. Requires a battery to operate. As a digging tool, a pickaxe can indeed be used to dig, mine, or even defend oneself if needed. A pile of long wooden planks. They have been laying idle, just waiting for a chance to be used. A lead pipe used in plumbing to deliver water where needed. Has been taken out of a piping system to be used as a weapon of personal destruction. Metal tool with head resembling jaws. Definitely useful for wire cutting and some light bending. A portable lamp running on gas, suitable for camping. 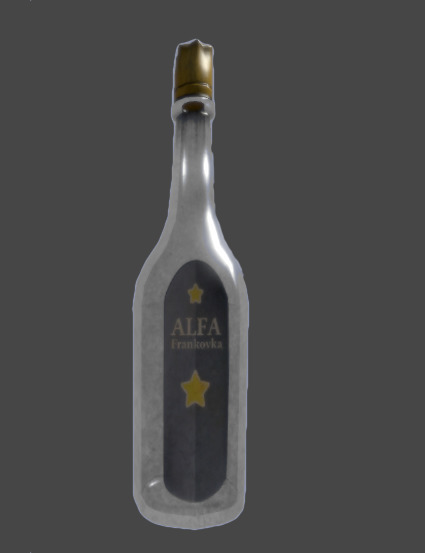 It provides enough light to brighten those dark Chernarus nights. A portable stove. Camper's best friend, this handy gas-fueled cooker can be used to prepare a meal anywhere. A metal pot. Used for different cooking techniques involving fire. Result depends on ingredients used. Portable gasoline-powered generator. Provides enough electricity to power a small home for as long as the fuel lasts. It lacks the magnification and stability of binoculars, but makes up for it by its ability to precisely measure long range distances. 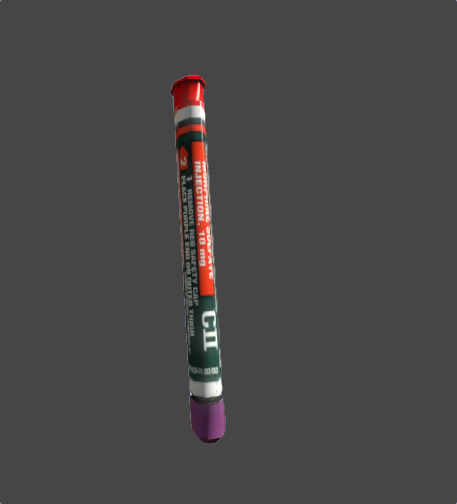 An emergency flare. Burns with red light, bright enough to light the surroundings at night. Can also be used to light fires or for communication. Strong rope, used to tie stuff together, be it things or people. Regular screwdriver. Can be gently inserted into a screw, or into somebody's jugular. A spacious storage box. Quite heavy, but seems to be durable. A pocket-sized universal sewing kit, comes in handy for patching both clothes and people's wounds. Ordinary shovel. Strong, steel blade easily splits both soil and skulls. Deployable light source. Needs to be powered beforehand. Consumes a lot of energy. A sharp table knife, used for cutting steak. Serrated blade cuts any meat with ease. 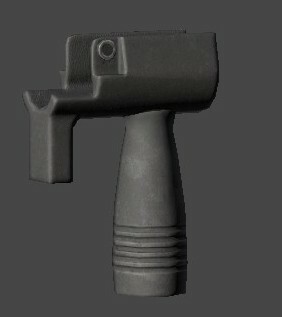 Non-lethal melee weapon used for crowd control. Requires batteries to stun the rowdy target. A deployable tripod, used to suspend cooking equipment over an open fire. A wooden box, containing complete and universal gun-care system. Used in firearm maintenance. This whetstone can be used to sharpen edges of various bladed weapons and tools. Useful for splitting wood or other objects, including closed cans and an occasional forehead. Adjustable metal wrench made for dealing with fasteners. Small enough to be used in tight space. A string with colorful electric lights. Can be hung around for that special festive look. A can of nutritious and long-lasting baked beans. If unopened, it will last two to five years depending on storage conditions. Crunchin' Crisps, delicious breakfast cereal made from highly processed grains, sugar, vitamins and trace amounts of hydrogenated petroleum. A reusable plastic bottle used by military and campers. Can be filled with various liquids. Bell pepper, green variety. Has plenty of nutrients and vitamins, and can be used for cooking. A package of pepper seeds. An ordinary, garden variety potato. Can be re-planted to grow even more potatoes. Dried cow milk. It has a remarkably long shelf life, and is very nutritious. It can also be eaten, but is somewhat dehydrating. A package of pumpkin seeds. A bag of long-grained rice, usually consumed when cooked with water. Conveniently packaged for easier preparation. A can of bacon. 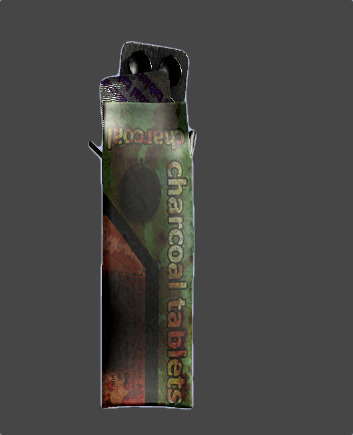 Smoke flavor added! Fully cooked! Delicious! Unopened, it lasts over 10 years. A tomato. If we leave the fruit-vegetable debate aside, it is still tasty and edible, either raw, or cooked. A package of tomato seeds. This zucchini is just ripe enough to make a fine meal if cooked. It can also be eaten raw. A package of zucchini seeds. This backpack with external frame offers huge carrying capacity. Also it effectively doubles the silhouette of the bearer. Compact backpack with enough capacity for necessary gear. Convenient for airborne operations. A cuddly teddy bear toy. Even though it's stuffed, it is able to conceal small items, somewhere. A child backpack. Not very practical in terms of carrying space, but helps keeping a low profile. Highly modular backpack, made from heavy-duty fabric. Versatile, great for short deployments. A watertight backpack. However unfavorable the weather conditions may be, gear stays dry whilst being carried. A textile pouch used to carry and protect first aid kit, mainly from the weather exposure. Standard hunting backpack with closable pockets. Very durable and comfortable, if a little old-fashioned. Tall mountaineering backpack made from hi-tech materials. Spacious but sort of noticeable. A rugged, plastic, airtight container. Very durable, used to protect sensitive gear. Relatively small pack. Can be attached to vest to further increase its carrying capacity. Lightweight backpack used for all day trips. Comfortably support any load that fits in. Comfortable backpack for prolonged carrying. Also offers quick access to the bottom part of the cargo space. Flexible watertight container. Capable of protecting contents from dust, sand, dirt and water. All-terrain shoes, designed to protect the feet during everyday activities. Oversized teardrop-shaped lenses and a thin metal frame. Protects the eyes from the sun. Battle Dress Uniform jacket with classic camouflage pattern. It makes for a popular alternative to more expensive hunting gear. Battle Dress Uniform pants with classic camouflage pattern. It makes for a popular alternative to more expensive hunting gear. Ski mask, designed to expose only part of the face. Very useful in cold weather. Soft cap with a curved bill and rounded crown. It is effective at shielding the eyes from the sun. Head-hugging knitted cap. Provides warmth in cold weather. A blouse is a loose-fitting upper garment, part of formal women’s attire. Originally created for pilots and eventually became part of popular culture and apparel. A very practical wide-brim hat, though not very warm. Popular among fishermen. These pants are halfway between regular pants and shorts. They can be comfortable, if ill-suited to cold weather. Slightly unfashionable, but extremely comfortable and warm pants. They come in a variety of patterns. Cheap, slightly unfashionable, but extremely comfortable short pants. Not suitable for colder weather. Loosely cut pants suitable for tough work in the outdoors. Distinguishable by pockets on legs. Green sporting outfit. It is comfortable to wear and possibly makes you run faster, although that has never been proven. A leather pistol holster that is worn around the shoulders, placing the pistol on the chest. Leather and canvas boots. They provide ankle stability and protect the feet while on rough terrain. A construction helmet used to protect the head from impact of falling tools, debris or any blunt force. High-crowned, wide-brimmed cowboy hat. Associated with ranch workers. A denim jacket, tightly fitting and fashionable. Offers some protection from the environment and looks cool. Made from plastic with a fashionable wrap-around design. Protects the eyes from the sun. A rugged dirt bike helmet. Offers decent protection against shock and other incoming damage. Has attachable parts. Shoes, part of men's formal outfit. Strangely enough, they go well with tracksuits. Firefighting force uniform jacket. Protects wearer from heat and water and makes him instantly recognizable. Standard issue firefighting force helmet. Protects from heat, water and any possible head trauma. Firefighting force uniform pants. They protect wearer from heat and water and make him instantly recognizable. A rounded flat cap with small brim in front. Never gets out of style. A full face gas mask with one filter. Used to protect from airborne pollutants and toxic gases. Fits the 'Nuclear, Biological, Chemical' suit. Military patrol jacket. Made from durable material, suitable to higher altitudes, is designed to keep you warm, yet flexible. Bulletproof helmet used by special forces in life threatening situations. Protects both head and face with the attached visor. Face shield with double polycarbonate glass, adds protection for the face when attached to the Assault Helmet. Military patrol pants. Made from durable materials, suitable to higher altitudes, designed to keep you warm, yet flexible. Massive steel helmet used by knights. Protection is still as good as it was hundreds of years ago. A tactical vest designed to hold as much gear as possible while maintaining full mobility. Highly durable, water resistant boots, designed to protect the feet and ankles during all types of outdoor activities. Versatile boots, with their design making them the middle ground between hiking boots and athletic shoes. A lightweight windproof and water resistant jacket. Favored by hikers all around the world. A lightweight hockey helmet. Used to protect head from impacts and members of the opposing team. An old goalie hockey mask. Designed to protect face from impacts of hockey puck and sticks. Hooded sweatshirt with vertical zipper and a large pocket provides decent protection from the elements. Durable pants, designed for prolonged periods of time spent outdoors. The camo pattern makes for an ideal hunting outfit in the right environment. Durable jacket, designed for prolonged periods of time spent outdoors. The camo pattern makes for ideal hunting outfit in the right environment. Light sleeveless vest, used by hunters. Offers little protection, but has pockets. Does not limit your movement. A pair of denim trouser shorts. These offer almost no heat isolation or damage protection. Shoes designed for running. Not very suitable for difficult terrain, nor for rainy weather. Simple jacket, used by janitors, handymen and workmen everywhere. Intended to allow wearer to work in adverse conditions. Simple pants, used by janitors, handymen and workmen everywhere. Intended to allow wearer to work in adverse conditions. Type of durable combat boots, designed for use in wet and humid environments. A white colored laboratory coat made from cotton. Can be worn with glasses, to make you look smarter. Model designed for military use, this classic piece of clothing is both durable and comfortable to wear. Not to mention warm. A jacket, designed to be worn as part of men’s formal outfit. Part of medical scrubs, worn to keep your hair in place and to protect from possible blood splattering. Part of medical scrubs, these pants offer little protection from damage or cold. Can be used to scare people who are afraid of doctors. Part of medical scrubs, this shirt offers little protection from damage or cold. Can be used to scare people who are afraid of doctors. Ballistic helmet with rails for accessories and NVG shroud. Specifically used to protect the head during combat situations. A beret with an insignia stitched on one side. It doesn't offer much protection, nor does it provide much thermal comfort. Designed to be worn by soldiers during combat. They provide the grip and stability for a rugged environment. Comfortable women’s dress. Will keep you looking pretty in any situation. A protective helmet with visor for motorcycle riders. Hard outer shell absorbs impacts with ease. A respirator designed to protect the wearer from inhaling harmful dusts, fumes, vapors, or gases. Classic nurse dress with short skirt and multiple pockets. Comes in multiple color variants. Designed for military use, but quickly found their way to the civilian market. They offer decent protection from the elements. An officer cap with a crown, a band, and a peak. Its original purpose is mostly for showing rank. Standard issue paramedic jacket. Not that different from any other work apparel, except for the bright, reflective stripes. Standard issue of paramedic pants. Not that different from any other work apparel, except for the bright, reflective stripes. Classic foldable side cap. Also used by various youth organizations. A peaked police cap is worn as part of a police uniform. Standard issue police force uniform jacket. Quite warm and comfortable. Uniform jacket of the OREL special police force unit. Somewhat warm and comfortable. Standard issue of police force uniform pants. Somewhat warm and comfortable. Uniform pants of the OREL special police force unit. Somewhat warm and comfortable. A standard vest worn by police. 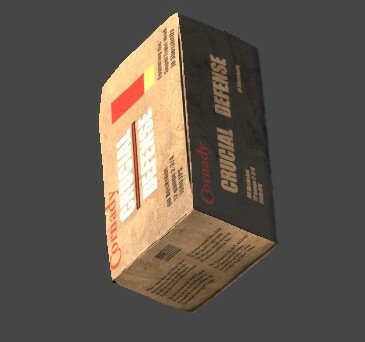 Consists of several layers and is capable of reducing the impact of knife attacks. A ballistic vest. Able to absorb various types of impact damage. Used by various organizations around the world. Standard issue prisoner uniform jacket. It makes you stand out in the crowd, it is not very warm or practical. Standard issue prisoner uniform pants. They make you stand out in the crowd, it is not very warm or practical. Standard issue prisoner cap. Goes well with full prisoner uniform. A revengeful spirit lives in this pumpkin. Highly compressible puffer jacket. Protects from cold very well, but suffers from low water resistance. A warm hat that covers most of the head, including ears and forehead. A jacket made from water resistant fabric with extended collar and hood. Helps to protect upper body from rain. Safety vest, often used by road workers. It is useful, if you wish to be seen from afar. Classic motorcycle leather jacket, rugged, durable and protective. Not to mention badass. While not the original Santa's beard, it's the next best thing. A replica of the Santa hat. Not only does it include a pompom, it provides some warmth as well. Short sleeve T-Shirt with round neck line and a regular fit. Nothing special. A durable skate helmet. Absorbs impacts nicely, but does not offer much protection from cold or rain. Plain denim skirt. Clearly unsuitable in cold weather, it offers almost no protection from lecherous looks. Thin pants designed for formal meetings. Can be worn in chilly weather as well, though there are warmer alternatives. Light and useful vest that could be expanded with attached utility buttpack. Sneakers are sport shoes. They are currently used as casual footwear for everyday use. Highly functional design that wraps around the head. Protects the eyes from the sun. Helmet used during combat situations. Provides head protection from impact, shock, and shrapnels. Latex surgical gloves. 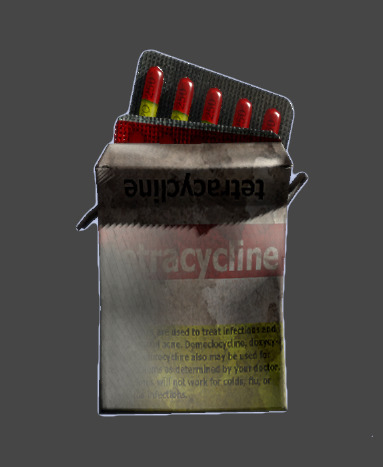 Originally in sterile package, not suitable for manual labor but protect from infectious agents. A classical surgical mask. Offers some protection from airborne agents, and also helps you remain unrecognized. Thick long-sleeved wool sweater. It is very warm, very absorbent, and itchy as hell. Machine washable. Three color camouflage military jacket, offers quick access to large cargo pockets. Also offers decent protection from the elements. Military boots. They provide a combination of grip and stability suitable for a rugged environment. Three color camouflage military pants, they offer quick access to large cargo pockets. Also offer decent protection from the elements. While providing protection to hands, tactical gloves were made to maintain dexterity as well. Designed for the military, with eye protection in mind. Elastic headband keeps them from sliding off. A lightweight windproof and water resistant jacket. Originally worn by military under the vest. 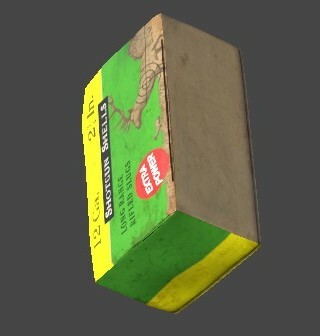 Used by tank crews. Bumpers provide head protection inside a jolting vehicle, but little else. Apparel of Russian navy, telnyashka shirt is a thin and tightly fitting underdress. Rectangular thick frame with a retro design inspiration in mind. Not really protecting or helping in any way. Made from plastic with a stylish slim design. Not really protecting or helping in any way. Casual jacket, designed for comfort and athletic purposes. It has become one of the most commonly worn items of clothing in the world. Casual pants, designed for comfort and athletic purposes. They have become one of the most commonly worn items of clothing in the world. A fully adjustable vest with a number of pouches, designed to hold everything a soldier needs to survive for days. Marine combat uniform jacket. Not too different from other military uniforms, this model is made distinct by its multi-scale digi camo. Marine combat uniform pants. Not too different from other military uniforms, this model is made distinct by its multi-scale digi camo. A classic hat made from dyed animal fur with ear flaps to protect against the cold. Protect the eyes, face and neck from ultraviolet light, sparks and heat while welding. Large and durable rubber boots that reach just below the knees, designed to protect feet from getting wet. A jacket, designed to be worn as part of women’s formal outfit. Heavy wool coat. Looks classy while keeping the wearer warm. Durable leather boots, popular among industrial workers. This boot is as heavy as a civilian boot gets. Working gloves made from hard cloth, able to withstand rough handling while providing protection. A widely used helmet designed to provide protection to pilots. Includes large visor. Traditional headwear, suitable for chilly or windy weather. The name comes from the viper-like pattern. If anything is missing or incorrect, get in touch with us by E-Mail, Facebook, Google Plus or Twitter.